An outstanding opportunity for the right government agency to obtain a vessel which normally takes 4-5 years to complete. 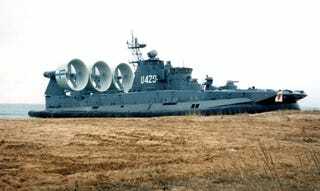 These vessels are proven in service with the Russian and Greek navies and their square-shaped pontoon structure provides a rugged, stable and seaworthy platform. The middle section accommodates the compartment for armored vehicles to be landed with the two outer sections housing the troop compartments, crew living quarters, life support and nuclear, biological and chemical protection areas. She is complete with navigation and electronic systems.